Members of Spyralle’s in-world group were treated to several new group gifts in the second week of the new year. If you are a member, please wear your tag and touch the gift boxes at Spyralle’s main store at Mauna Waipi’o. More gifts are in the works! 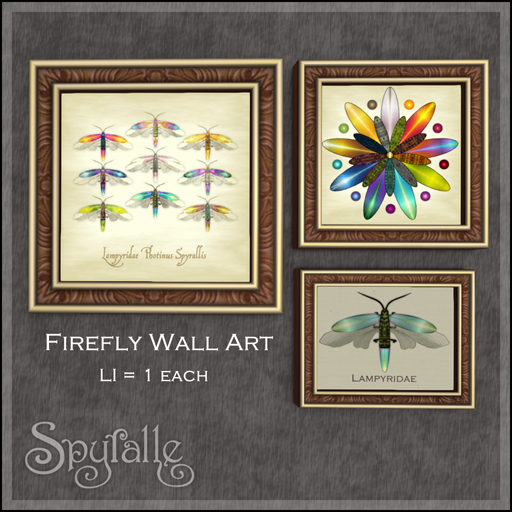 These new originals were prompted by many requests during the “bug hunt” by people who wanted the insects for their own. The hunt versions came in many different colors, so I put them together in a texture change HUD so everything can be mixed in over 2900 combinations. Custom bugs! The first release was the scarab beetle shown above. It is actually the fourth (at least) version of this mesh insect I have made, new in 2019. 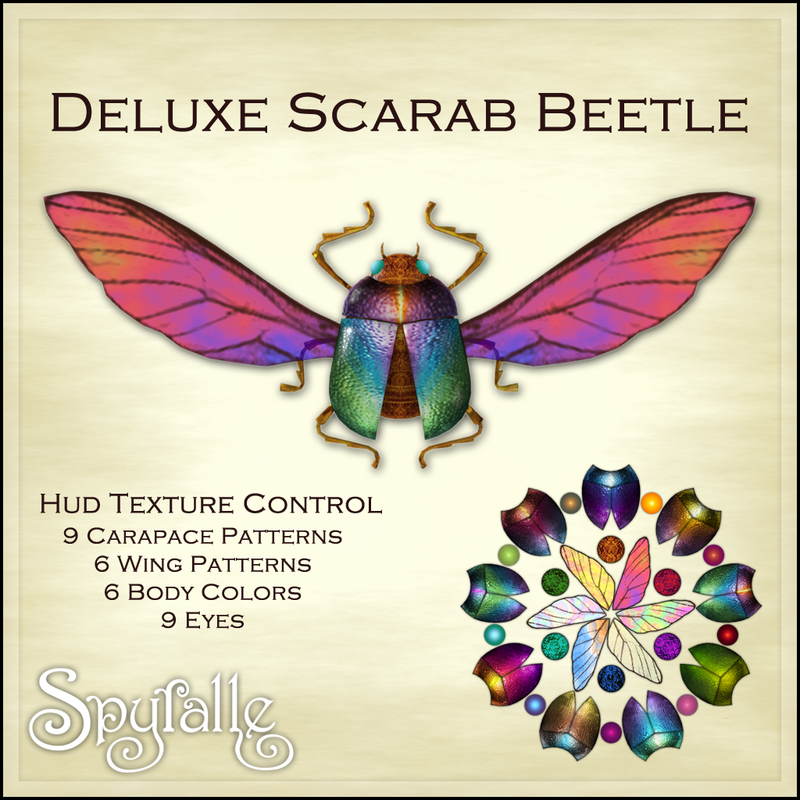 This version gives you texture change for the body (six colors), the eyes (9 colors), wings (6 patterns), and carapace (9 patterns). All of the textures use my original fractals created with Ultra Fractal or Apophysis. The gift package contains a larger than life size copy to rez for decoration and a smaller copy that will attach to one shoulder for wearing. A super huge copy is on display at our main store. The texture change HUD works on both, and they should be modifiable when rezzed. Making the HUD for 6 and 9 variations was such an interesting and fun design challenge I decided to offer it as a framed piece of wall art, which led to other framed pieces. The set is the second group gift. Once I got into the scarab project, of course I had to go full bore on the firefly! 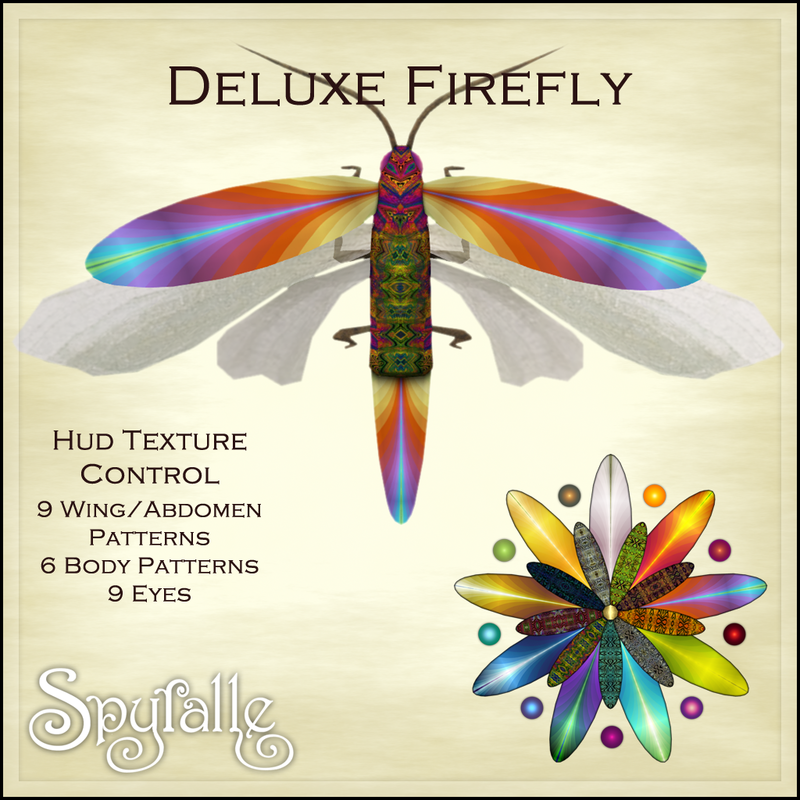 On this one, you can use the HUD to change the body (9 patterns – there is a typo above), the wingcovers and abdomen (9 patterns; they change together), and the eyes (9 colors). The Firefly also comes in a large rezzable version and smaller shoulder attachment. 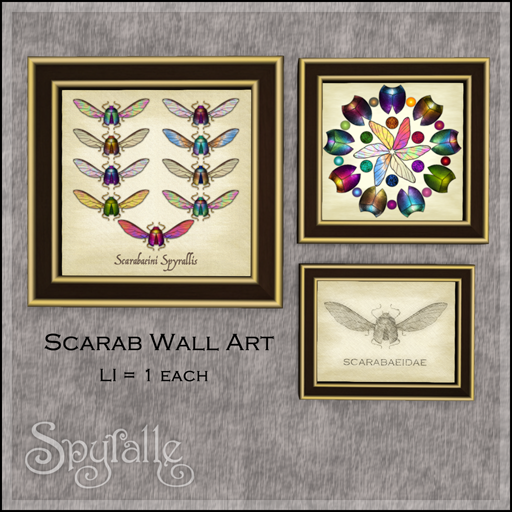 These gifts will be out for a limited time, free to Spyralle Studio members. They may be available for sale to the general public at some time in the future. There is a group joining fee in effect while the New Year gifts are out, but if you wait to purchase these later, they will cost a lot more than the fee. Next question: Will there be gift sets for the beetle (also known affectionately by the team as Bug 1)? Definitely! I am working on it between projects for upcoming events and hope to have it out before the end of January. This entry was posted in Specials and Gifts and tagged fractal, Home and Garden, insects, Jewelry, Spyralle. Bookmark the permalink.